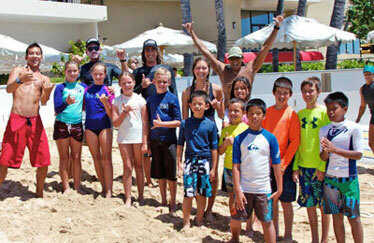 Ty Gurney Surf School proudly offers programs designed especially for kids! For young surf stars, we recommend a private lesson for personal, one-on-one instruction. Got a gaggle of groms? Our Kid’s Surf Camps and Party Packages are fun, educational programs at the beach, fully supervised by our instructors and ideal for children of all surfing abilities. 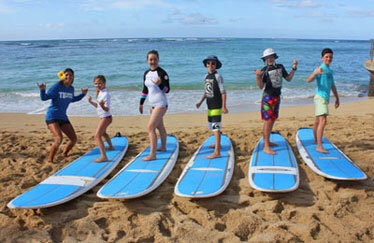 Our multi-day Kid’s Surf Camp will get your keiki stoked on surfing and the ocean! Especially popular among our local kama’aina families, kids are introduced to surfing and ocean safety in a fun, supervised environment. 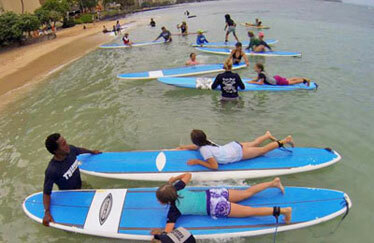 Camps are held at the beach in Waikiki directly across from our shop. Camps are typically scheduled during school breaks and holidays. 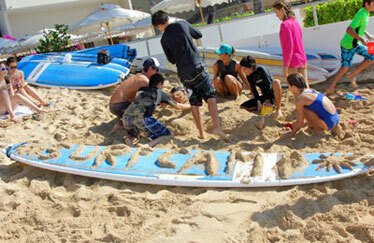 Kid’s Surf Camp dates will be posted on this page, so please check back for upcoming camp information. To instantly receive the latest updates, follow Ty Gurney Surf School on Facebook, Twitter, and Instagram. Upcoming birthday or special event? Book a Party Package to bring even more stoke to your child’s big day! A Deluxe Party Package including cakes, drinks, and more is also available; please contact us for information and rates. Please contact us so that we may work with you directly to create the ideal party for your kids.